Obama-Appointed Judge Blocks Wyoming Oil Lease Sale Over ‘Climate Change’ | Watts Up With That? It’s not just difficult, it’s impossible to perform any meaningful analysis on the volume of greenhouse gas emissions that may result from lease sales and awarding leases. Not all leases get drilled and not all wells are productive. How strong is Wyoming’s oil recovery, and will it last? In Wyoming, a state depleted of once robust fossil fuel revenues, the recovery has spurred hope. Oil is just one of the three commodities that tanked in recent years, but its comeback has brought unexpected revenue right before a legislative budget session. Clearly the agents of the Obama maladministration can’t allow this happen… Why do I refer to Judge Contreras as an agent of the Obama maladministration? Contreras was close friends with Peter Sztrok, the disgraced former FBI agent who engineered a perjury trap for former National Security Adviser Michael Flynn. Contreras is believed to be the FISA Court judge who signed off on the first fraudulent FISA warrant for Carter Page. Contreras accepted Flynn’s guilty plea, even though Sztrok’s initial report said Flynn didn’t lie. Contreras was removed from the Flynn case and replaced by Emmet Sullivan, who immediately issued a Brady Order to Mueller’s inquisitors demanding they turn over any and all exculpatory evidence they had in their possession. The U.S. must stop drilling for oil and gas on more than 300,000 acres in Wyoming because the Bureau of Land Management failed to account for the cumulative effect of the activity on global climate change, a federal judge in Washington ruled. “Given the national, cumulative nature of climate change, considering each individual drilling project in a vacuum deprives the agency and the public of the context necessary to evaluate oil and gas drilling on federal land before irretrievably committing to that drilling,” U.S. District Judge Rudolph Contreras said in a 60-page decision. Contreras faulted the federal government for merely summarizing the potential impacts without elaborating on the degree to which its decisions may contribute to climate change. He stopped short of voiding the Wyoming leases at issue, ordering the bureau to re-examine nine of its environmental assessments and “no significant impact” findings, and barring the BLM from authorizing new drilling in that state until it satisfies its environmental-law obligations. The groups suing, Wildearth Guardians and Physicians for Social Responsibility, challenged the federal government’s approval of 473 oil and gas leases covering 463,553 acres across the three states. The judge hasn’t yet issued his rulings on the challenged Colorado and Utah leases. The judge is probably waiting to see how quickly his ruling gets overturned before moving on to Colorado and Utah. This is a standard tactic of Enviromarxist terrorists environmental activists. They sue the regulatory agency to invalidate lawfully issued drilling permits or otherwise render lawfully awarded mineral leases un-drillable. This is what they did to Shell in the Chukchi Sea… just dumber. They aren’t challenging drilling permits. They are challenging the awarding of leases. In a drilling permit application, it’s at least mathematically possible to estimate future greenhouse gas emissions from individual wells. It’s absolutely impossible to do this at the time the leases are issued for the purpose of calculating the cumulative future emissions for a leasing area. DEMS DEMAND OFFSHORE DRILLING INFO BEFORE CONFIRMATION HEARING: A group of Senate Democrats are calling on the Interior Department to release more details about its anticipated offshore drilling plan prior to next week’s confirmation hearing for acting Secretary David Bernhardt. Contreras’ ruling is nothing more than an unlawful continuation of Obama maladministration regulatory malfeasance. 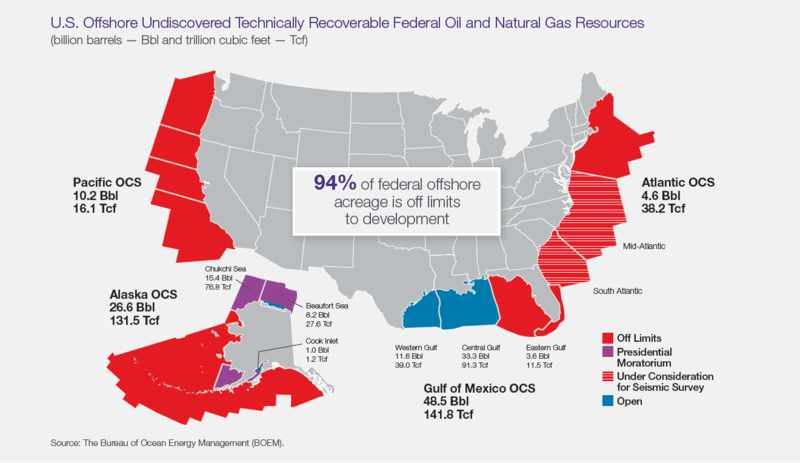 Should the Trump administration attempt to open some of the 94% of the Outer Continental Shelf (OCS) currently off limits to exploration & production (E&P) activities, the same sort of lawfare will be waged against it. Firstly, there is no such thing as “seismic testing.” Secondly, marine seismic surveys have been conducted over just about every square meter of the outer continental shelves of the world over the past 50+ years, with no evidence that it has harmed marine life… At least not due to the use of marine airguns. Hat tip to SMC and CTM for bringing this to my attention. Is this judicial decision grounds for impeachment on the basis of political bias? It absolutley is. But it would take a majority of the House of Representatives and 2/3 of the Senate to impeach and remove this @$$ hat. Or the good judge can visit the Cibolo Creek Ranch in the Big Bend area of Texas and spend the night. Simply include, what all other environmental reports have fail to, the environmental benefit of the release of the stored carbon and create a case where the positives outweigh the negatives. The climate will warm an infinitesimal amount, and the planet will get a little bit greener. A better question is, … what constitutional right did said Justice have for issuing said “judicial decision”, given the following COTUS context? Appellate jurisdiction refers to the power of a higher court to review and revise a lower court’s decision. … III, § 2 of the Constitution vests appellate jurisdiction in the Supreme Court, and 28 USCA §§ 1291–1295 grant appellate jurisdiction to lower federal courts of appeals. Does the Federal Judge drive a car? Fly on a plane? Heat his house with NG? Can someone file a complaint against him for exacerbating climate change? If so many Republicans weren’t NeverTrump shills. Hi, please delete this comment. Thank you. I do not wish it to appear out of fear of what powers they have. Intelius, too late! Duck and Cover! The judge who blocked this project, Rudolph (Rudy) Contreras, an Obama appointee, is also one of the FISA judges who approved the warrants to spy on our President. “The BLM must include in the redone reviews the effects of each new oil well on overall emissions in the U.S., including the pumped oil’s downstream effects, Contreras’s ruling said.” Is this a new legal requirement, or is it a judge legislating? 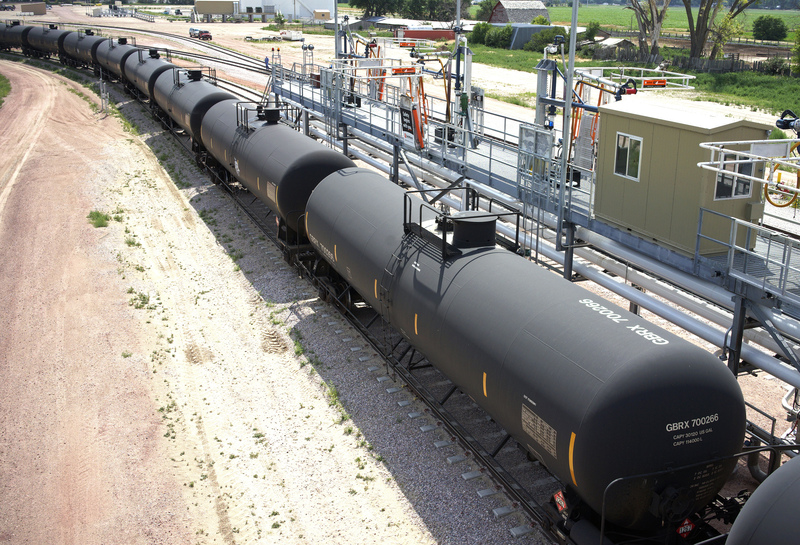 The EAs acknowledge that oil a gas drilling on leased parcels will emit GHGs, and they describe the sources of those emissions, but they do not attempt to quantify and project the GHG emissions likely to result from a given lease sale. For instance, certain EAs acknowledge that each potential oil or gas well on the leased parcels could emit approximately 0.00059 metric tons of carbon dioxide,12 but they state that “[t]he [total] amount of increased emissions cannot be quantified at this time since it is unknown how many wells might be drilled, the types of equipment needed if a well were to be completed successfully . . . or what technologies may be employed by a given company for drilling any new wells.” AR13989; see also AR13754; AR28220; AR55015–16. Likewise, certain EAs incorporate a report quantifying and projecting consumption-based GHG emissions in Wyoming through 2020—the “Wyoming GHG Inventory”—but the EAs do not attempt to apply those projections to particular lease sales. See AR3412; AR19503. Although the EAs acknowledge that GHG emissions may contribute to climate change, they conclude that “[t]he inconsistency in results of scientific models used to predict climate change at the global scale coupled with the lack of scientific models designed to predict climate change on regional or local scales, limits the ability to quantify potential future impacts of decisions made at this level.” AR3435; see also AR28219. Ultimately, the EAs conclude that “[w]hen compared to total national or global emissions, the amount [of GHG emissions] released as a result of potential production from the proposed lease tracts would not have a measurable effect,” AR13989, or would represent only an “incremental contribution to the total regional and global GHG emission levels.” AR55023. BLM cannot determine exactly where a well or wells may be drilled or what technology that [sic] may be used to drill, complete and produce wells, so the impacts listed [in the EA] are more generic, rather than site-specific. Additional NEPA and technical engineering analysis would be conducted prior to approval of an APD to ensure that the proposal is compliant with all Federal and/or state rules and regulations. Then he proceeded to rule that BLM had to produce a detailed comprehensive forecast of the total effect, full life cycle, that the 11 most recent BLM lease sales would have on the climate. The BLM in the Wyoming region holds 4 lease sales per year. This Obama hack basically nullified 3 years of lawfully conducted lease sales on no other basis than his own mental greentardation. Perhaps this is an opportunity. The issue seems to be that an unknown climate effect was initially specified and needs to be quantified, rather than ignored. Even based on the worst case ECS claimed by the IPCC, the climate effect of burning the maximum possible amount of recoverable oil can be bound to be less than an undetectable tiny fraction of a degree and no seismic studies are required to make this assessment. And let’s not forget the benefits of all that CO2 being released. The judge is remiss in not weighing the known benefits. Washington D.C. District Court Judge Rudolph Contreras would probably find out upon ultimate appeal to SCOTUS sooner or later that it is not in her wheelhouse to decide these matters of greenhouse gas emissions. Activist judges now in both USA and Canada are doing structural damage to the economy and our ability as nations to uphold legal commerce. Witness what is going on in Canada on multiple files. It is time that society at large review and censure the ability of activist judges to disrupt the national and state/provincial economies, that is not expressly in their purvey. “the same sore (sort?) of lawfare will be waged against it. Auto-corrupt probably counterpunched, David. Ya gotta watch that auto-corrupt program. We need a Supreme Court ruling that forces the nation’s courts to consider the benefits of fossil fuels as well as the hazards. If activists are allowed to insist on complete safety from all hypothetical hazards, they can pretty much prevent everything. In theory, you couldn’t even drive to work … and anything you do at work would be a hypothetical hazard to someone anyway. Society would come to a screaming halt and we’d all die. Increase what effects of climate change? What a ridiculous statement! This is their argument? There are no effects of climate change (CAGW) evident. This judge is operating on a false assumption. CAGW is science fiction, judge. The judge is operating under a myriad of false assumptions. IOW the judge does not have the technical qualifications to assess the evidence to come to an informed decision. But when did that ever matter to an activist judge? will be a good enough acceptable standard for such assessments, in all same or similar cases, with no any more intricate details needed. When the last judge is strangled with the entrails of the last environmentalist we will have peace. Until then we will be tortured by watermelons in black robes. Delay, delay, delay. Just like Brexit, a delay is a victory. Everything hinges on maintaining a Supreme Court majority with a commitment to the integrity of the US Constitution and black letter law. This case is just one more of many examples of why that is so. The Eco-Marxists entire agenda eests on subverting written law and the Constitution. And they need a Dishonest Liberal majority on the Supreme Court for that. Thus we will hear ever louder calls from the Left to defeat Trump and Pack the Supreme Court with 4 additional Marxists. 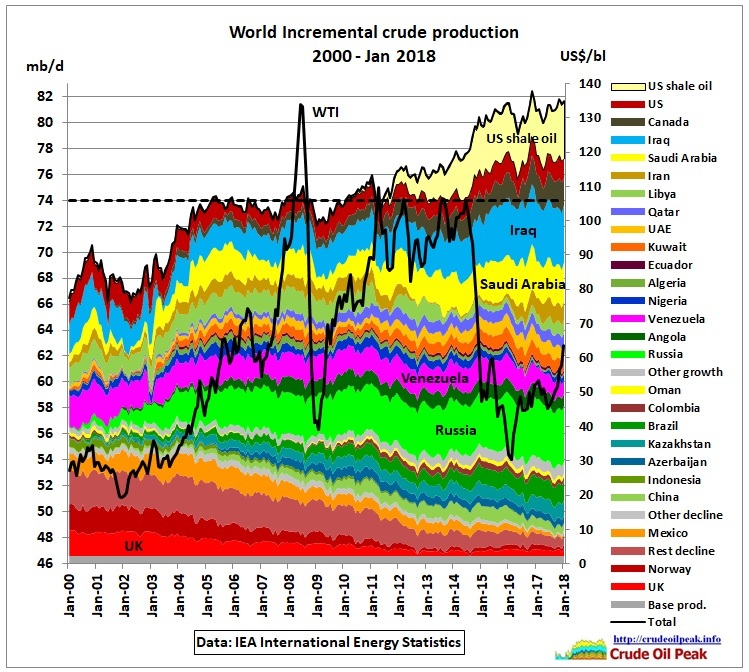 how much oil will the US import in 2019?? what judge will stop it?? Maybe big oil should countersue the applicant ngos for restricting lawful commerce. There is no law against producing oil and gas. I would seek an injunction against the plaintiffs’ USE of oil and gas. This must be the activity that has 5he impacts. Maybe the customers want to us3 it for making plastics or cloth fibres or for lubrication. The O&G producers dont tell their customers what to do with the products. No need to. Warren Buffett who backs the left will see this as a hit upon his oil trains and take action. It’s not nice to fool Unca Warren!!! Why is it these ignorant people think we are the ones that have to do something? Because they are also deluded into believing that”Something” needs to be done. Judge Napolitano reported on this decision, on Stuart Varney’s program this morning and claimed this Obama appointed Judge was a fine judge … a ‘conservative’ Judge … and made a perfectly logical decision. And no, at no time during his 3-1/2 minute soundbyte did he refer to a single fact written above, other than the ruling requiring the analysis of downstream impacts to every new oil well. I don’t think Obama ever appointed a conservative judge, and Napolitano has said a lot of left wing loony things in the last little while, as Fox has been turning into another leftist fake news outfit. I stopped listening to Napolitano a long time ago. When all the other Legal Analysts look sideways and mumble “I don’t know what he is talking about” when asked to explain one of his pronouncements, it is probably time to get a new Sr. Judicial Analyst. Napolitano is a NeverTrump shill. Yes, Judge Nap. has been revealing his core values … one appearance at a time since Trump was elected by The People. And his values are rotten to the core. If you were to believe the alarmist theory, catastrophic Global Warming is just that; global, not national. Thus what is the sense in restricting US production of fossil fuels if the nations that produce much more CO2 than the US are unconstrained? I wonder if this is a good time to point out that the US Constitution does not give authority to the Federal Government to even own that land, let alone cordon it off for religious reasons. Uh oh! You just got surveilled by the FBI as being an “anti-government” extremist who probably doesn’t “believe” in Federal Income taxes either … your constitutional thoughts are veryyyyyy dangerous … to power. Governments shouldn’t attempt to block oil and gas revenue. They are going to need it when the rampaging hordes of health claims against wind farm ultra sound start to roll in. These judges are either ignorant, stupid, or corrupt. Or all three. I hope Ginsburg learned from her ridiculous recommendation of the South African constitution during the Egyptian Arab spring to young, reform-minded Egyptians that it is only in the context of a prosperous Western style culture that her concepts of law and justice have any meaning, and that destroying that culture will invalidate everything she stand for. Same for this judge. They’re corrupt; all green mafia staff. But they sublimate their guilt by convincing themselves they’re doing it for our long-term good. I’m just fed up with the continued advance of control over every aspect of our lives by the all powerful federal government. This week this truck driver had to drive a 2019 Volvo on a team run and it sucked. The experience reinforced my conviction that I want nothing to do with truck models after 2016. The proximity and lane departure “safety” systems making noises and flashing screens and lights of disapproval when that computer had no idea the conditions the driver is working under. I was driving through construction where there were multiple lane shifts and that damned thing reported back that I was diverging from the lane multiple times and I got a call asking me “what’s up”? I’ll stay in the 2015 Frightliner I’m driving until the wheels fall off or I retire. Which ever comes first. It’s official that we will be getting both dash cams and driver cams in the trucks before the end of the year. Dash cam welcome. Driver cam most certainly not! The AI boosters tell us that you will be automated out of a job in a few years anyway, so no worries, right? Efficiency will increase and there will be fewer accidents we’re told; a new paradise. Sure – when pigs fly. But I suppose they are working on that too. I hope I’m around in 20 years so that I can throw all their stupid predictions in their faces. No surprise Judge Napolitano backs the decision. Murdoch is the worst of the Globalists because he’s two faced and incredibly sinister. His real life is dedicated to taking as much as he can from you. He loves and wants carbon trading more than anything on earth. Trump is a fool for listening to him. This should be appealed. The basis of the decision is daffy. The impact on climate change is unknown. The laws and executive orders allowing Judge Contreras to intervene in this case should be revised. Giving standing to activist groups which are little more that predatory law firms is ridiculous. Well, as President, Obama said we cant just drill our way out of high gas prices, and his appointee is still trying to inflict that policy on all of us. Sorry, but it looks like that judge is an idiot when it comes to knowing about CO2, climate, and energy…just sayin. Where is that Animal House “Zero point zero” clip when you need it? Play that for the judge to explain the effect of each individual well and all downstream activity on temperature projection in 2100. I may do something along those lines in a “sequel” post. Another example of too many COGS (Constantly Offended Green Socialists) and not enough sensible people engaged in the processes of government. It is a problem now across the whole world, except in totalitarian administrations. In those places (all socialist/communist) of course the views of the COGS are ignored because they are not free to comment. One other small point raised by a contributor at WUWT recently. The opposite of socialism is not capitalism, it is “freedom”. That is one of the most profound observations, I have read in recent times. Thank you WUWT for its openness, and for allowing all opinions/views to be submitted. I would like to draw attention to https://youtu.be/bT1iFhGKOI8. That’s what they try to do. It is not an accident they have common interest with both Russia and China. Climate change alarmists consist mostly of two broad groups. 1) People who do it to forward socialist agenda. Destroying a good economy is plus for these people. Most calamities of AGW, could, in case they realize themselves, easily adapted to. Wyoming is by no means capable of even slowing AGW down. The emissions growth from China and India during the next 10 years will make the US look funny. This type of Judicial overreach is despicable. Federal judges don’t have the power or authority to hold an economy at randsom just because they have a personal delusional belief in the disconfirmed CAGW hypothesis. In accordance to the rules, an environmental impact study was conducted and submitted to the BLM on these new oil leases. This is just judicial nuisance and harassment by a Leftist judge that should be formally censured for his illegal actions as an example to other Leftist hack judges who want to play these silly political games. It’s frustrating how often this same canard gets repeated ad nauseam and goes unchallenged: That there is such a thing as “clean energy”, and also that it is not fossil fuels. I have never even seen an attempt at defining “clean energy”, much less a rigorous quantitative explanation and defence of the term. I find it difficult to believe that there is a legal definition. I’m just wondering if District Court Judge Rudolph Contreras bothered to define specifically what he meant when he used the term “climate change”? Robert, most definitely! The question: is it the twilight before the rising of the sun (the light of logic, scientific objectivity and “test all things, hold fast to that which is true” thinking) after a decade or more of its near-absence in the field of climate science and “green energy”, or is instead the twilight before the setting of sun (an extended period of abject mental darkness and superstitious beliefs by the majority of mankind related to climate science and “green energy”, similar to the previous Dark Ages in Europe)? Well, that’s why he was put on the bench – as an enforcer. That’s what Obama did for his tenure – stacked the deck with activists. I predicted when Gordon was elected Governor of Wyoming, the minerals industry would be destroyed within four years and many, many more bird choppers would destroy the landscape. He already vetoed a bill to let the legislature hire a lawyer to sue to put in coal ports on the west coast (that’s how I understood the bill). If you’re hoping for an appeal and the Governor has to be involved, cross it off your “wishing and hoping” list. Wyoming gave tax breaks, etc, to get the supercomputer in Cheyenne (complete with hundreds of virtue signaling bird choppers) to prove oil and gas and coal are horrible. Sorry, folks, Wyoming leaders are not interested in fossil fuels. They FULLY back global warming, bird choppers and teach climate change in schools. I cannot feel sorry for any of this. This is what Wyoming wants at the “leader” level, and we keep electing the Greens. But it’s ‘for the environment’, right? So what harm can it do? That’s one of the frustrating things about places where people go who like wilderness – they don’t seem to understand the issue has been hijacked. This is what happens when the voice of reason sits idle or permits itself to be silenced. And that’s exactly why Trump needs to do what the Republicans have been too incompetent to do: Get off his laurels and finally appoint a commission to review the so-called science of climate change. Its first order of business should be to review the alleged evidence that fossil fuel emission of carbon dioxide is the cause of increasing carbon dioxide in the atmosphere. Several scientists have now shown conclusively that it’s not. Once that’s established, the house of cards collapses. The incite, delay, and ignore playbook is still operating. Methinks the activists are targeting the federal leasing authority, and that Judge Contreras got the memo. That has been their modus operandi… Abrogate the rule of law, in favor of the rule of eco-fascist morons. It’s simple really judge. Any oil or gas production from this region will replace a similar amount from another part of the globe where there are less environmental regulations. Therefore any production in Wyoming will have zero impact on the world’s climate. Unless of course, judge, you are speaking on behalf of the UN/IPCC world “government”. No… According to the Agents of OBAMA… It’s only OK if give tribute to Saint Al Gore before awarding the leases.